We all know that too much salt in our diet is not good for your body. A high density of salt can lead to death or the absence of life (i.e. the Dead Sea). Likewise, I think a Christian can be so salty that their belief can come off as more exclusive and end up being more detrimental in being a Christian. Detrimental, in the sense, that instead of bringing people closer to Christ, it pushes more and more people away. There are some people who are so Christian that they no longer can carry regular conversations with people who are not as deep into their faith as they are (those who are not on their level when it comes to faith and biblical knowledge). While I admire their faith and their piety, I don’t think the point of being salt of the earth is to hang out (solely) with other salt of the earth. They surround themselves with Christianese stuff. Their car has bumper stickers ranging from NOTW to Covered in His Blood to Bible verses or the fish swallowing a Dawrin fish with feet… They listen to nothing but CCM. They only watch a movie if Kirk Cameron is involved, or if the media outlet is “spiritual.” Their Bible is color coordinated with highlights. Like I said, I admire their piety and their devotion to all things faith. But after a while, it becomes crystal clear: In their world, there are insiders and outsiders; you are with them, or you’re not; to be a good Christian, your life should start looking like theirs. These are things people have actually shared with me. Whether these people know it or not, at some point, to be fully welcomed in their circle, I have to forsake everything and step into their bubble. Let’s be clear. For me, it’s not forsaking everything and following Christ, but forsake everything and follow their culture and idea of a Christ-like life. Big difference. I understand the whole we are from this world but not of this world. I get that the world is broken and that evil runs rampant in this world. I understand the call to not conform with the world. But is there a way to do that without so blatantly drawing a invisible line of what is holy and what is not? And truthfully, the line isn’t between holy and unholy but what the culture of a particular church finds acceptable and unacceptable. And yes! I think there is a way to not conform to the world without being so different that you push people away. The fact that we’re labeling one thing as “spiritual” (or more “acceptable” in some cases), as Rob Bell says, we automatically labeled something else as not being “spiritual.” But as Bell continued, the Hebrew language doesn’t have the word “spiritual” because to early Hebrews, everything was spiritual. I had a conversation with my brother and he was talking about how he and his friends at his church are “done” with this world and can’t wait to go “home” (home = heaven). I know many other fellow Christians who think like that. But, God isn’t done with this world. So how can they be? As much as some Christians try to label this world as broken, evil and that we should abstain from the things this world offer, I just wish I could remind them that God created everything in this world and saw that it was good. If God was done with this world, then why keep it around? And John 3:16 states that God so loved this world. Yes, the same world that we try to condemn, leave, be set apart from… God didn’t see it that way. The people who proudly display WWJD should really think about what exactly Jesus would do, in regards of this world. He didn’t separate himself from it. He didn’t stay within the walls of the temple and only talk to others who were as learned in the Scriptures as he was. In fact, that’s what this Advent season is about. God, the Holiest of Holy, instead of making Himself more holier and separated from the world, he became part of this world. God immersed Himself in creation. He became like us so that we can be more like Him. And did Jesus limit himself to just other religious folks? No. His anger was reserved for those religious. If we keep ourselves so salty that we are no longer part of this world, who, then, will give people hope, love, grace and peace that is only be given by God? Who will be God’s presence in this world? Who will be the hands and feet of Christ to those who are in need? On whose beautiful feet will the Good News arrive from? I’d like to think that Jesus wanted us to be the salt and light of the world, while being in the world. Jesus wanted us to bring “flavor” to the people of this world. To show them glimpses of God’s kingdom. To bring them good news, hope, love, grace, joy and peace. To gracefully and lovingly guide others into a life of faith and sacrificial living. I’d like to think that Jesus didn’t want the salt of the world to be collected and remain clustered in one place, isolated from the world and waiting for the world to come to them. 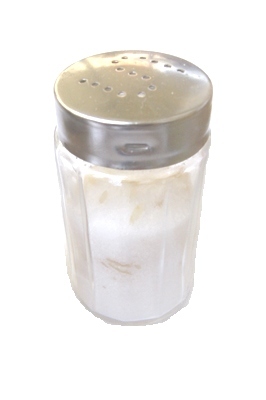 I don’t think when Jesus said “you are the salt of the earth” that Jesus viewed us like salt shakers, where all the salt is kept in one structure, away from everything else, and where salt is sprinkled only when needed or desired.